The power of social media just may enhance the actions of a boycott that could prove painful to Israel. What if Israeli boycott started to really take a strong hold? Individual initiatives have increased after people have been calling to boycott the Criminal State of Israel, which is pretty bad for Israeli products and brands associated with Israel. Paradoxically, boycott actions which are perpetrated by one individual have a potentially way bigger impact than actions which are being carried out by an association. There’s only one condition : there have to be lots of individuals acting everywhere, self-reliant and over a long period of time. One may intimidate with associations taking legal proceedings, websites, or any other militant group. 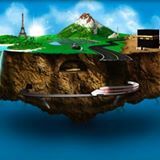 However, it becomes extremely difficult to prevent Franck, Rasheed, Salome and Phan, who live in every corner of the globe and who are complete strangers to one another, to support a boycott action. Now let’s imagine users all over France realize that they can act on their own, alone, from home. Actually, let’s pretend that this picture has been printed then times by each one of them, or even several hundred times. Just a few users can create a snowball effect which can cross boundaries. They then distributed them in their neighborhood or put them on cars in different parking lots, such as those of Carrefour, Auchan, Casino… etc. grocery stores. 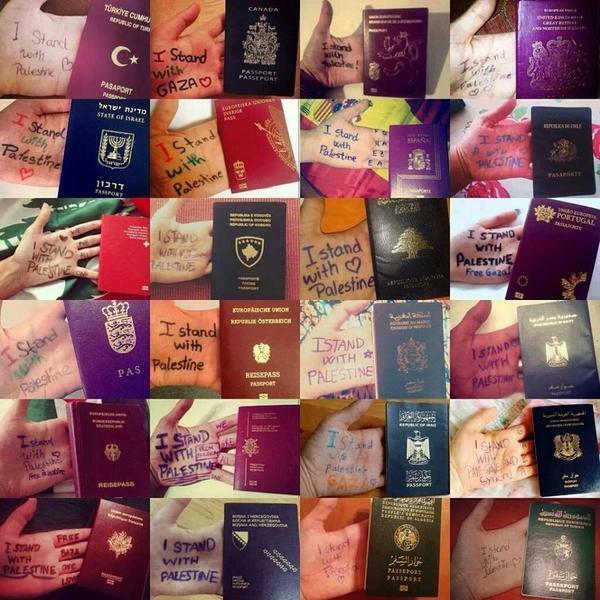 Let’s imagine now that each and everyone of these actions accessible to anyone has been filmed or photographed, and put to social media just like it happenned a few days ago when users from around the world showed solidarity with Gaza by taking a picture of their hand and their passport. Just a few users can create a snowball effect which can cross boundaries. Until then, everyone still has to realize that they don’t need anyone in order to act (print a poster, take a picture, publish to Twitter or Facebook). Palestine’s friends have a weapon in the form of their keyboard. Will they realize and use the Internet as well as its infinate ability to unite all the goodwill in the world to make it a formidable weapon in the Israeli boycott ? Some have already taken action, not waiting for any union (usual justification) or the blessing of an association. Here are for example some little papers which have been distributed in the Sodastream area (brand located in illegal colonies) and on the shopping carts of a grocery store. Silly ? Uneffective ? Not too sure. Imagine only one person would do this in every grocery store and post their pictures on Twitter. This could be thousands of actions, thousands of photos that could serve in the Israeli boycott, give courage to the boycotters, give comfort to the martyred Gaza and put enormous pressure on the brands trading with Israel. Who would then be able to stop it all ? Nobody. Here’s another action, individual, again. Posters have been distributed in the Sodastream area of a grocery store, but also in the baby wipes section, which most of them are being manufactured in Israel (particularly the stores’ brands, Auchan baby wipes, Carrefour and Lidl ones, etc.). Israel and its followers are terrified of boycott. Apart from intimidation, one can overread some inconsistencies trying to discourage people from supporting the boycott. They argue that “in order to be consistent”, one should boycott all products linked to Israel, which includes all the brands that have stores there. Nonsense ! First off, this is totally impossible, and secondly, the boycott -in order to be effective- has to focus on a few brands only, because otherwise, the collective effort would be lessened. Millions of people boycotting two or three brands will have more weight than the same people distributing their effort on hundreds of brands. And in the end, why deprive ourselves of some excellent and dreadfully effective Israeli products in order to boycott… Israel. 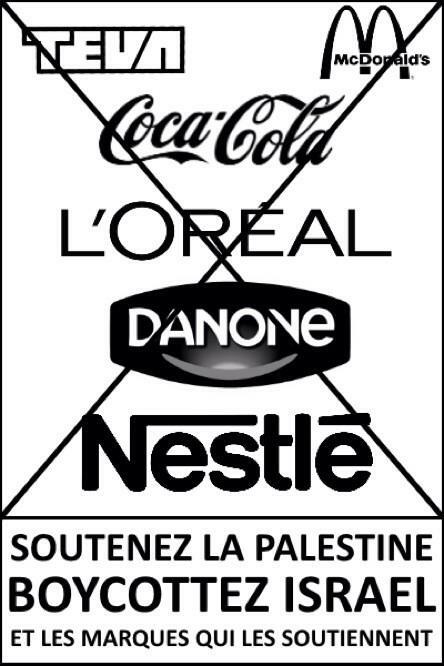 Pourquoi NESTLE fait partie de cette liste ? Les sionistes extremistes déclarent que boycotter ne sert à rien car on ne peut le faire parfaitement sauf à renoncer à notre téléphone, pc comme évoqué dans cet article. 1- qu’eux même utilisent le boycott ou crient à qui veut l’entendre que c’est inutile, preuve de son efficacité. Bref, je boycotte, tu boycottes, nous boycottons ! J’ai également un montage de tous les logos correspondant. Si vous vous voulez la vérifier et la publier faite moi signe..